With a small group, construct a Toobeez structure. Then write clear “how-to” directions so another group can duplicate the unique structure. Divide up the Toobeez equally among groups each small group. Discuss the purpose of “how-to” writing (see information below). *“How-to” writing is a type of sequential expository writing which informs a reader how to complete a task. 2. Have students determine some purposes for how-to writing, and record their ideas on the board or on chart paper (for example, recipes, kit instructions, etc.). 3. Share a sample of how-to writing with the class. You can use a transparency or chart paper. You can also hand out individual samples to the groups. 4. Arrange students in small groups of four or five. 5. Have groups write down two or more characteristics of this form of writing, and then have the students share their ideas with the class. Record how-to writing characteristics for the class. Some points they should include are: short/concise, clear, numbered, inclusion of each step and so on. 6. Read aloud the following Activity Challenge Box to the group. Challenge: With a small group, construct a Toobeez structure. Then write clear “how-to” directions so another group can duplicate your unique structure. 7. In the small groups, students will take their share of the Toobeez to create a small, but detailed, structure. Inform students that tube size and color must also match. They have 15 minutes to complete this task. 8. It is helpful for group members to take on a job title (Designer, Recorder, Illustrator, and Coordinator). The Designers create the structure while the Recorder writes and numbers each step taken to create the structure. The Illustrator sketches the structure recording colors and sizes of tubes. The Coordinator watches the time and may ask the teacher any necessary questions. 9. *Important. Once a group has completed their structure, all group members should agree the sketch and written steps are accurate. The steps should follow the guidelines of good expository writing as discussed earlier in the class. Then, the group can disassemble their structure. 10. Now, have each small group switch the Toobeez and written instructions with another finished group. Illustrators should hold on to the sketched picture for their group. 11. Groups should reassemble the structure according to the written instructions. 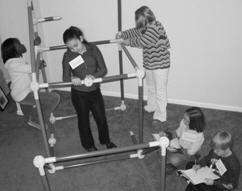 Once each group assembles the structure, the original group’s Coordinator will compare the structure to their own sketch to determine accurate assembly. 12. After the activity, move to the “Activity Discussion and Processing” section of the activity. The Illustrator (left) and the Recorder (right) must pay close attention to record every detailed step. What should be included in good “how-to” instructions? What was challenging about writing how-to instructions? What do you think helped groups to be successful in writing clear directions? Did your group respect the roles given to each member? How did having roles help your group communicate with one another? How did you contribute to your group’s outcome? What did you find challenging about working as a team during this activity? 1. The need for every step. Students often take certain steps for granted in this type of activity, and so they often have a difficult time truly understanding the importance of detailed directions. As an introduction or if groups had a difficult time with this activity, extend this task by providing your own poorly-written instructions to the students. When they have a difficult time, they will better understand why including each step is crucial. Allow students to revise the poorly-written directions (they love to do this on their teacher’s writing) to improve the instructions for building the structure.2. Extension/Follow-up. Allow students to revise their written steps based on feedback from the group which attempted assembly.